With over 20 years experience in Tree Surgery, Landscaping and Grounds Maintenance, All Seasons North West Ltd provides all types of landscaping, grounds maintenance and tree surgery to both domestic and commercial customers across Wirral. 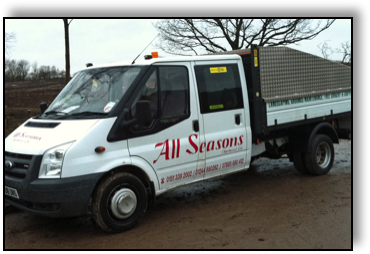 We also specialise in commercial site clearance for small businesses, national organisations and local authorities. We supply seasoned logs for fires and wood chip for gardens to customers throughout the Wirral area. Set-up in 1993, the business is located in Ledsham (Ellesmere Port) and covers Wirral, the North West and further afield. We have a professional team, trained to a high standard. With such a wide variety of skills and resources, we can start the contract by clearing the site, landscape to requirements and then maintain the area whether a small garden or large commercial grounds. As part of our service, we will visit to assess the work and provide a no-obligation quote. Steve and his team carrier out the removal, thinning and stump grinding of a number of trees at the front of our property. The house is situated in a conservation area, all trees had TPOs and as a council requirement the ones removed required replacing. Steve handled all contact with Wirral Borough Council and completed all the necessary paperwork. They also replaced the trees which were removed. We were very pleased with the work undertaken and would not hesitate in recommending All Seasons.